There may be a pretty mournful tune coming out of Detroit these days, but over in China, everyone's gone car-crazy. Consider this: in 2000, the private vehicle stock numbered about ten million automobiles. A McKinsey report out in June projects that ten million cars will be sold in 2008 alone. China is now the second-largest automobile market in the world after the U.S.
China's romance with the automobile is reminiscent of America's back in the mid-twentieth century: a personal car means comfort, convenience, and tangible proof of newfound wealth to the millions of Chinese entering the ranks of the middle class (the New York Times ran a piece on this phenomenon back in April). The big difference is that China's car culture is coming of age in a post-cheap oil world. Two weeks ago the Chinese government hiked gasoline prices (which the state sets) by 16 per cent, as the global price of oil continues to hover around record levels. A gallon of subsidized gas now costs around $3.83 in China. If this sounds pretty good to you, note that the GDP per capita there is about $2,000 a year. And of course, as we know all too well, more cars on the road can mean spiraling pollution and deepening dependence on fossil fuels. China's appetite for oil has already led its government to rub shoulders with such unsavory partners as Sudan. Pollution in China is a horrific problem. 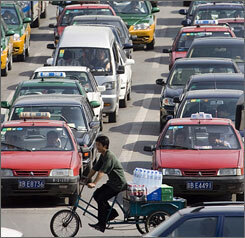 The IEA has projected that there will be seven times as many cars on the road in 2030 as there are today. Even given that China's fuel standards are way higher than our own, that's still a lot of oil and pollution. Now, we can lament this trend - and many have. Or we can think about ways in which it presents opportunities. China might be a great candidate for leapfrogging technologies - that is, skipping over intermediate generations of technology and moving directly to the cutting edge. The rapid spread of mobile phones in developing countries is a good example. People are benefiting from the communications revolution despite their countries not having made expensive investments in fixed-line phone infrastructure. Could China leapfrog straight to new, more environmentally friendly technologies for automobiles? There are reasons to hope that China will learn from our mistakes and take steps to encourage research, development, and deployment of high-fuel economy, low-emissions vehicles. The Chinese government has already put a few policies in place to try to deal with pollution and to slow growing consumption of oil. The government will start offering a tax incentive for environmentally friendly vehicles, which will lower their price by about 10%. Fuel economy standards, as I've noted, are already more stringent in China than in the U.S. and are set to be tightened further. The Chinese standards are also "bottom heavy" - the biggest improvements are being demanded of the larger, most inefficient vehicles, which in theory should discourage infiltration by SUVs into the vehicle stock. Further opportunity lies in the fact that with sales slackening in the US and Japan, car makers are scrambling to produce in and sell to China. "These developing markets used to be an afterthought. Now they are the industry's future," says Hirofumi Yokoi, an analyst for auto market research company CSM Worldwide. Toyota, for example, plans to start manufacturing hybrid versions of its Camry model in Guangdong province, with an eye to accessing the Chinese market. As a place where automakers are eager to both manufacture and sell cars, China has some leverage over what its car culture ends up looking like. Will the Chinese government and Chinese consumers choose to demand more efficient, low-emissions vehicles, given their concerns over pollution and oil dependency? Do they have another choice? For OEMs (original equipment manufacturers, shorthand in the auto industry for the big brand name manufacturers like GM, Toyota, or Volkswagen), this could be a great opportunity to improve cleaner car technology and even to commercialize the next generation of plug-in hybrid electric vehicles (PHEVs). China's market is large enough to realize the learning potential of new technologies. Car ownership is still relatively low. 24 out of every 1000 people in China own a car, compared to about 800 out of every 100 in the U.S. Capital stock is also low - new plants can be built ready to roll out the next generation of technology, rather than old plants needing to be retrofitted. Given the low cost of producing in China and the learning curve afforded by the potential size of the market, China could very well be a key to driving down the price of cleaner cars to parity with traditional models. Clearly, commercializing low-emission and PHEV technology is an international priority. Equally clear, I think, is that the Chinese will be a lot more receptive to international cooperation on technological innovation than pressure to sign on to emissions targets. And given that the Chinese appetite for personal automobiles continues to grow, we should think about ways to ensure that they're getting the technology they need to make all those new cars as green as possible. The trick is to find innovative, equitable, and effective ways to support mechanisms enabling technology transfer, joint ventures that build a base of knowledge and physical capital in China, and international cooperation on basic research, development, and deployment. A few caveats: the Chinese government needs to be willing to negotiate on lowering the barrier to market entry for foreign automakers, make their joint venture requirements less stringent, and improve safety standards in their automobiles to make them ready for export. OEMs must take seriously the need to ensure that knowledge and skills are transferred, and to guarantee the same labor and safety standards in their Chinese factories which they uphold at home. And national governments need to work together to provide the right incentives to see cleaner cars effectively commercialized by the private sector, including transition incentives, support for R&D, smart institutions and mechanisms that foster innovation and tech transfer, and dealing with international intellectual property rights issues fairly (this is a post for another day, I think). So as terrifying as the prospect of even more traffic in Beijing may be, all those cars represent millions of people's aspirations and we'd do well to respect that. The whole world can benefit from a sustainably developed China. So what are some smart ways we can encourage it? China's demand for cars might offer one opportunity for international cooperation on a really significant tech breakthrough. Let's be on the lookout for more. Chinas production of Electric cars, solar panels, etc. at a low price is what will save us.